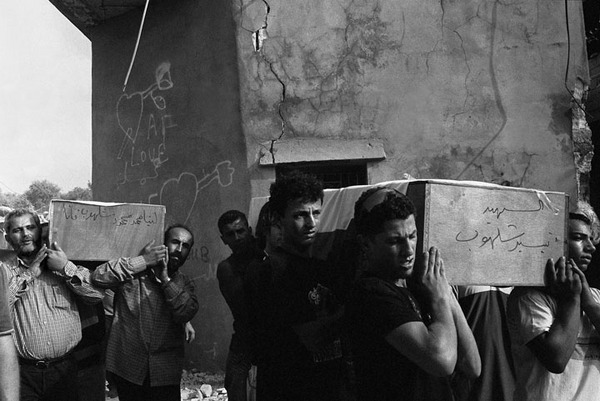 Family members and neighbors carry coffins to the gravesite during a mass funeral service in Qana, southern Lebanon, August 18, 2006. Israeli bombs killed approximately 40 people, an estimated half of them children, on July 30. The mass burial did not happen immediately according to Islamic tradition due to the ongoing bombardment. Farah Nosh, "Lebanon," in POYi Archive, Item #46179, http://archive.poy.org/items/show/46179 (accessed April 18, 2019).